Remember that confession I made earlier this week? About being downright addicted to revision? Well, that applies not only to revising myself but also to hearing about other people’s processes. And today, I have a guest on the blog! The talented Saundra Mitchell, author of SHADOWED SUMMER, shares her revision story, with a special offer for those of us who teach writing to kids. I think it’s safe to say that most of us don’t get up in the morning, throw on some underwear, then go off to greet the day. So why should authors stop working when their story’s still in its skivvies? No matter how carefully you plan, there’s still work to be done after the first draft. You can’t see the holes that need mending, and the spots that need more coverage until you’ve put down the first layer. And sometimes, you can’t see the holes at all. Or you think that a particular bit looks fantastic- when somebody who isn’t color-blind points out that it doesn’t match. You also need time to reflect- anorange and green dress shirt sounded like a good idea at the time, but something less garish would have shown off the fine cut of the fabric. Which is a hugely extended metaphor, but really: sending out an unedited first draft- whether to your teacher or to your editor- is same as going outside in your underwear. Technically, you’re clothed, but you’re not winning any points for class or style. will tell me to get rid of the green and orange shirt, or that I need to add a nice blazer to get the full effect. almost ready to be printed- but it wasn’t done! And I think the more willing we are to admit that talent doesn’t excuse us from hard work, the better all our writing will be. To hammer home that point, if you’re a teacher or a librarian, I have an offer for you. 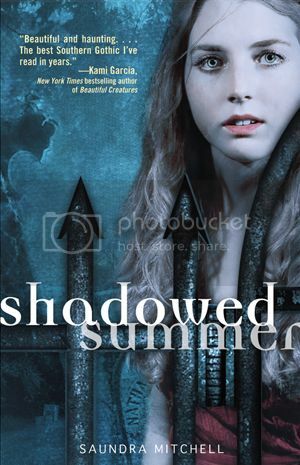 Just send your mailing address to saundra AT saundramitchell DOT com, and I will send you a few pages from my working manuscript of SHADOWED SUMMER to share with your students. These are the pages that my editor and copyeditor marked, so your students can see just how much work- big and small- goes into finishing a piece of writing. The offer lasts as long as I have pages left (it’s not a long book, so supplies are limited!) It’s a chance for your students to see a book in its underwear. It’s not pretty- but it’s part of the process! every secret is a family secret.